Since the Roman Empire, leaders have used ideology to organize the masses and instil amongst them a common consciousness, and equally to conquer, assimilate, or repel alternative ideologies. Ideology has been used to help create, safeguard, expand, or tear down political communities, states, empires, and regional or world systems. This book explores the multiple effects that competing ideologies have had on the world system for the past 1,700 years: the author examines the nature and content of Christianity, Islam, Confucianism, Protestantism, secularism, balance-of-power doctrine, nationalism, imperialism, anti-imperialist nationalism, liberalism, communism, fascism, Nazism, ethno-nationalism, and transnational radical Islamism; alongside the effects their originators sought to craft and the consequences they generated. This book argues that for centuries world actors have aspired to propagate through the world arena a structure of meaning that reflected their own system of beliefs, values and ideas: this would effectively promote and protect their material interests, and - believing their system to be superior to all others – they felt morally obliged to spread it. 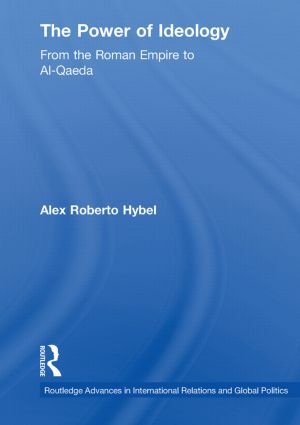 Radical transnational Islamism, Hybel argues, is driven by the same set of goals. This book will be of interest to students and scholars of international politics, international relations theory, history and political philosophy.